Arsenal now lies at the sixth spot in the Premier League table separated from the fifth-placed Chelsea on goal difference. Both the teams have 50 points each. After a comprehensive 3-0 win over Fulham, Manchester United climbed to the fourth spot with 51 points. 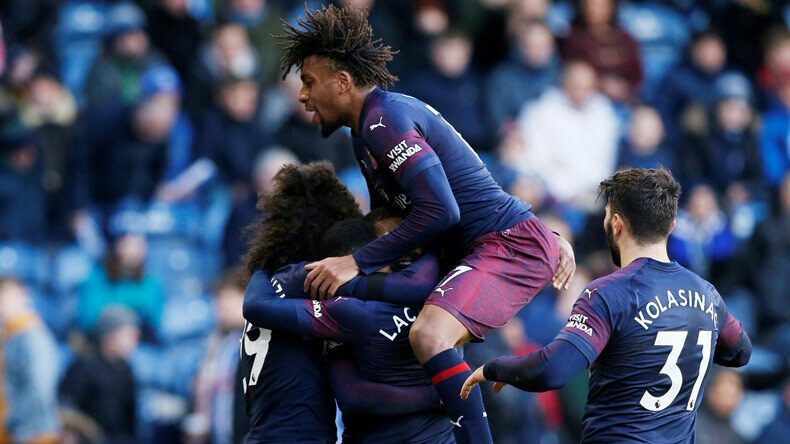 Arsenal maintained pressure on Manchester United and Chelsea for a top-four place in Premier League table after cruising past Huddersfield Town in an easy 2-1 victory on Saturday. The Terriers were wasteful in front of the goal despite displaying solidity in midfield, however, their frailties in defence were exposed by a clinical Arsenal side. Alex Iwobi and Alexandre Lacazette were on the scoresheet for the Gunner as they took their team level with Chelsea at the points table. Huddersfield started the game strongly with incisive passing and solid defending but failed to capitalise on chances created as they lacked clinical finishing. Arsenal pounced on an opportunity in the 16th minute when Alex Iwobi attempted a volley off Sead Kolasinac’s cross and it deflected into the back of the net giving a lead to the travelling North London outfit. The second goal came just before the half-time whistle when Lacazette drilled in a fantastic strike past a hapless Huddersfield goalkeeper. The home team tried to get back into the game in the second half but a rock-solid Arsenal defence marshalled by Laurent Koscielny made sure they took away all the three points from the match. It was Sead Kolasinac’s injury-time own-goal that provided a late consolation to clearly frustrated Huddersfield Town. Arsenal now lies at the sixth spot in the Premier League table separated from the fifth-placed Chelsea on goal difference. Both the teams have 50 points each. After a comprehensive 3-0 win over Fulham, Manchester United climbed to the fourth spot with 51 points. However, Chelsea still has game in hand, versus Manchester City, to reclaim the fourth spot in Premier League table.